An Open Source Project Nigeria Needs. Hint: Location! Location!! Location!!! If you want the ONE question that disproves the theory about the ‘wisdom of the crowd’ ask 10 000 Lagos dwelling (and possibly all of Nigeria) Nigerians to enter their postcode in a website. An incredible majority would uniformly enter 2341. That could not be further from the truth. 234 1 is the international dialing code to call a Lagos telephone number. Post Codes are an important ingredient in organizing the addressing system in a nation. Like with many thing in Nigeria, the Nigerian post code system is a huge mess and this has gone on to creating complexities in making deliveries, organizing people within areas etc. (It is a wonder how NIPOST has been allowed to steadily rot to practical non existence for the last decade. Not that it was any good before that). My friend Sanusi has proven the above baseless. Basically, postcodes could be made more ubiquitous. In this post I’d like to proffer a quite simple solution to reactivating the postcode system especially as it concerns the eCommerce sector of the economy. ALL Nigerian eCommerce companies and new age logistics providers especially the big players have to buy into a single solution. They are quite fond of doing things independently and secretly. This solution has to be independent aka open. NIPOST and government would contribute by giving moral support and getting out of the way. While initially thinking of this problem, I wanted us to recreate a new postcode or even addressing system for Nigeria. However, it may be easier to build the existing postcode system first. Yes, Nigeria has a Post Code System. I’ll suggest starting with Lagos than proceeding to other states. From the product end, I foresee the following steps in realizing the goal. Clean up the street name spellings and formats. Is it Awolowo Way, Obafemi Awolowo Way or Chief Obafemi Awolowo Way? Clean up can be continuous, so step 3 is not dependent on the completion of step 2. The big 5 eCommerce companies and top 3 logistics firms would agree to integrate this plugin and require ALL customers to input post codes. This is the most important aspect required for this to work. A system is only useful if it is adopted. Thankfully, this is something the private sector can push without requiring the government to interfere. So How Do We get This Done? All that we ask in return is the commitment of Konga, Jumia and 3 other big ecommerce companies to implement this and we are good to go. Knowing my country people, I will not be surprised if someone is looking for how to send a proposal to those in government and get paid millions to do this. BTW, either of the big lads can easily do this internally. However, the essence of this project is for it to be a collaboration or an independent effort. We have seen a lot of “my own my own” efforts but those do not get adopted because ulterior movies are usually suspected. Thereby making everyone lose out. A mobile version of this can be implemented. One button to get the Postcode/Address of any Location you are in. Nigeria needs to review and update it’s addressing system. Asides Abuja (thanks to El Rufai) navigating addresses is a huge maze. After this is piloted and succeeds, we can then push for the reorganization of our entire addressing system and of course NIPOST. In another short post (make e be like say I be prolific blogger) , I’ll explain a few non logistics but important usecases for a proper postcode system. Thanks Ope and Tim for your feedback. Nigeria’s Central Bank instituted a policy that requires a SINGLE identifier (BVN – Bank Verification Number) for every banking customer in the Nigerian banking system. Today is the deadline for participation and after which, you will not be able to access your money without it. On the surface, this is a GREAT idea and not different from the SSN (Social Security Number) system used in the US banking system. If you ask anyone the reason for this, they will list out the upsides to having a biometrically verified identity especially in the banking system. However I am VERY uncomfortable with it and that has to do with data protection in Nigeria or should I say a lack of it? The strength of a chain is determined by its weakest link. The system that makes it easy for FIRS to monitor all the accounts you have access to, also makes it easy for unscrupulous people to have the same access. My issue is, what systems are in place that prevents the unscrupulous access. 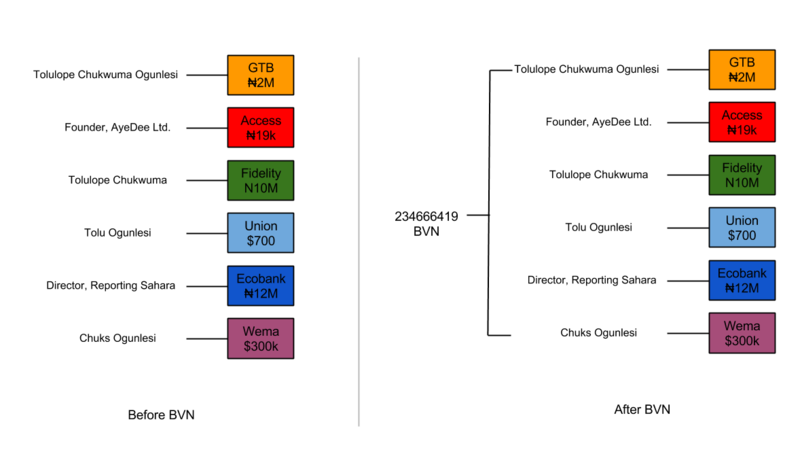 If Tolu Ogunlesi is found to be a member of any type of cabal and all his assets are to be seized, presently his ₦ 2 Million in GTB, ₦19k in Access and his $700 in Union Bank would be at risk. However, as we can see from his accounts opened with aliases, the man will still be balling. When Tolu an Instagram Celebrity and Private jet hopper declares Personal Income Tax on the amounts in the previous paragraph, “nothing can happen” since the FIRS would not be aware of any other source of income. They have no idea who Chuks Ogunlesi is after all. 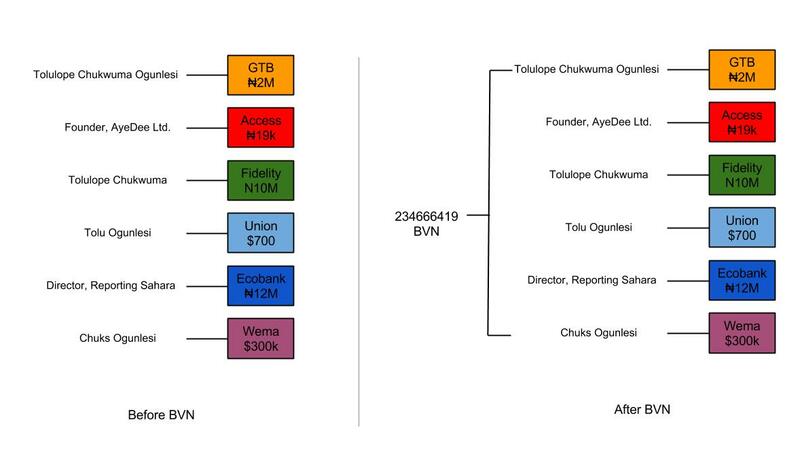 With the BVN system, all the accounts he is a signatory to are tied to a SINGLE identifier 234666419 . With a single query, the list of all his bank accounts would be pulled up. So there is no way to hide if the good guys come for the bad guy Tolu. However, risk is not about when things go right. HOW about when they go wrong? If some guys decide that “this Tolu sef too dey do sef” or wonder “what is this Tolu feeling like sef because he has over 100k Twitter followers” (Any thing can trigger anger over here) and decide to kpake him then wonder what his ransom should be, there will be no need for an ATM card to know how much he has. All they need to so is collect his BVN find out his worth and ask for the 50% of all his monies as their share. In theory, this should not happen but we all are aware that there is ZERO security on biometric data collected in Nigeria. Do I need to remind you how easy it is to access the SIM registration database? or how available our voter registration database is? Think for a minute, did you see any form of security when you went to register for your BVN? Now when the database is synced, the adhoc 50k/month staff at GTBank Oshogbo has access to it. Likewise the chap in the Aguleri , Nguru, Otoueke or gasp BENIN!! branch. I really do not have power to fight this BVN system however, if there is anyone out there who can, I’d like you to find out the following. Is there ANY system/person that can determine all your bank accounts with the BVN? Who has access to that system and what is the procedure to having that access? Has there been an external audit (preferably international) of the system as a whole to assess the security risks of the BVN system? Right now, I no too hold so I am not really worried or affected. But one needs to prepare for one’s future :D.
BTW, I looked around and could not see any Data Protection Law for Nigeria although I came across a bill trying to establish the Data protection Office. Thanks Boro for helping reduce the typos in this post.